The leaders of Lakeba have handed over the management of their pine schemes to the Lakeba Development Company Limited board. 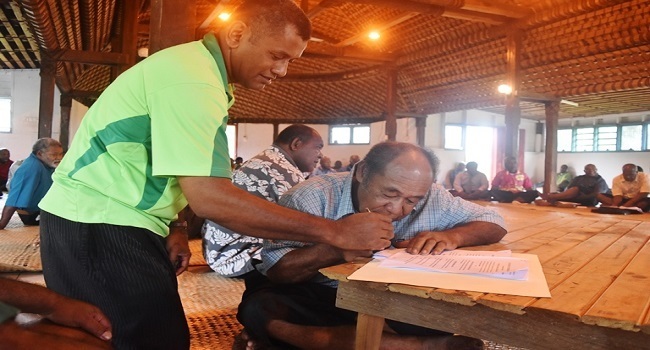 The handing over was witnessed by Minister for Forests, Osea Naiqamu in the chiefly village of Tubou. Speaking during the signing, Naiqamu told the villagers that as a business venture, they will see the benefits trickling down to the landowners. Operational work will be carried out in Wainiyabia and will include harvesting, processing and marketing of finished pine products. The Company will oversee all the aspects of the business and a consultant will be working on the island to ensure a smooth start. Lakeba has the largest pine scheme which is 1,500 hectares of pine.